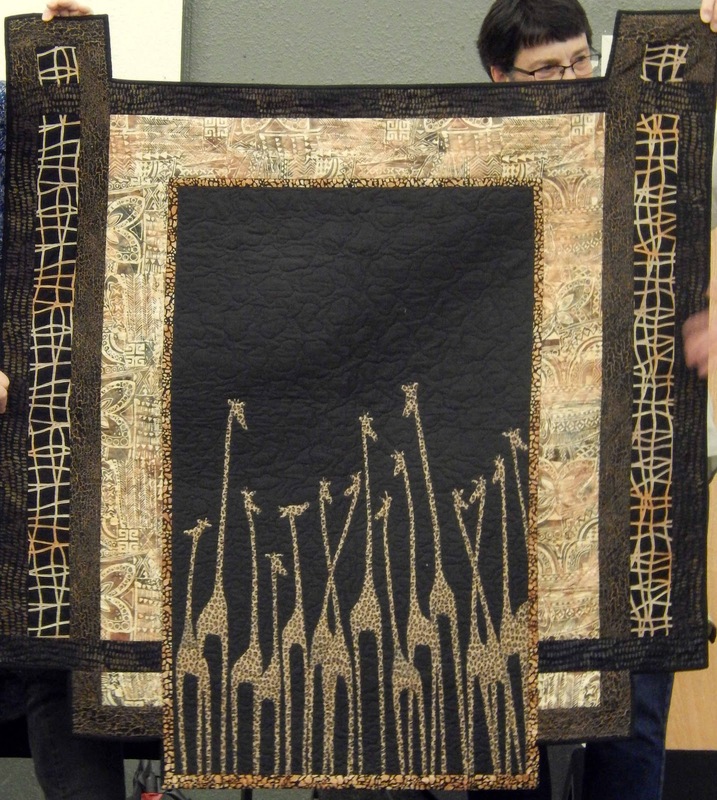 At the October meeting we were pleasantly surprised when our guild raffle quilt was revealed. 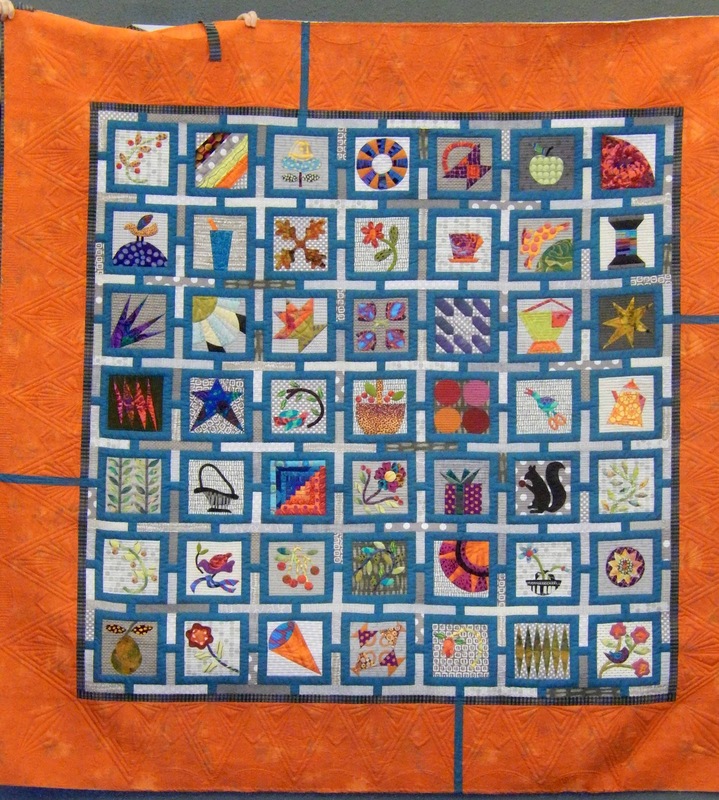 Several names were suggested, and the membership voted to name our quilt "Orange You Beautiful". It still needs binding. 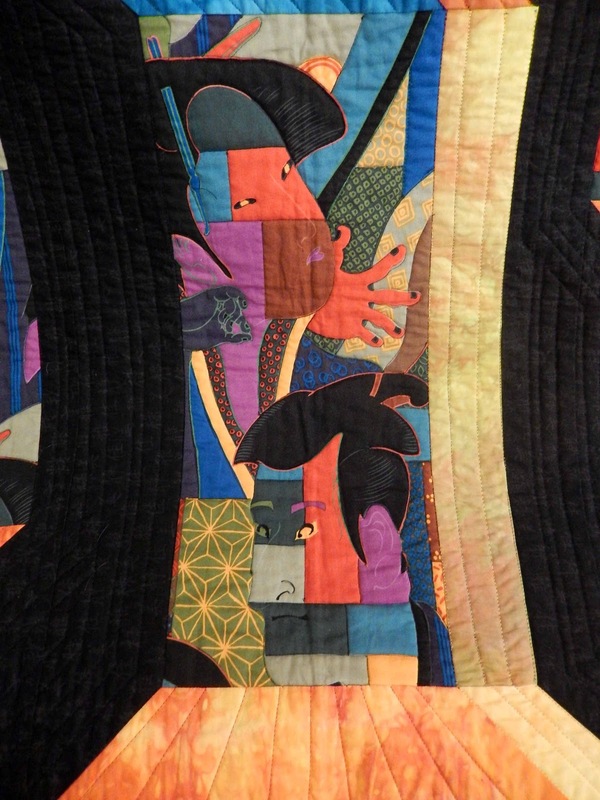 Mona Woo designed our quilt and it was quilted by AnnMarie Cowley. 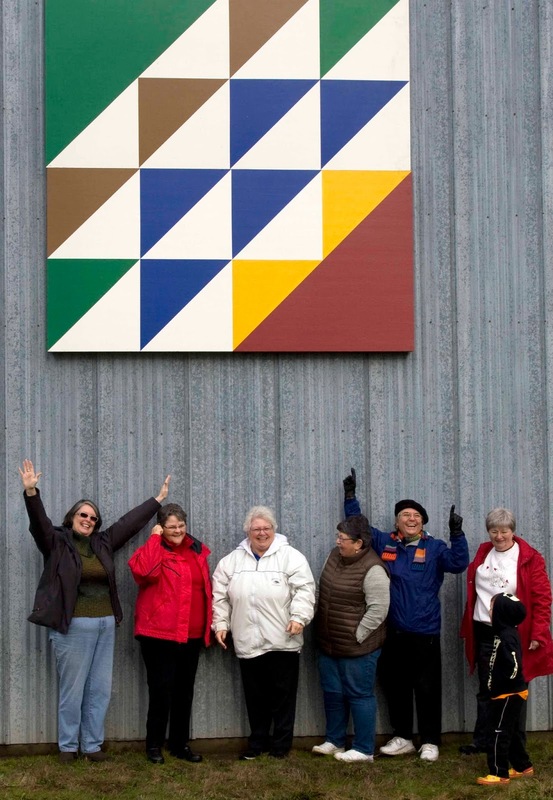 After our break for snacks, we were treated to a trunk show of the quilts of Patti Hyder. 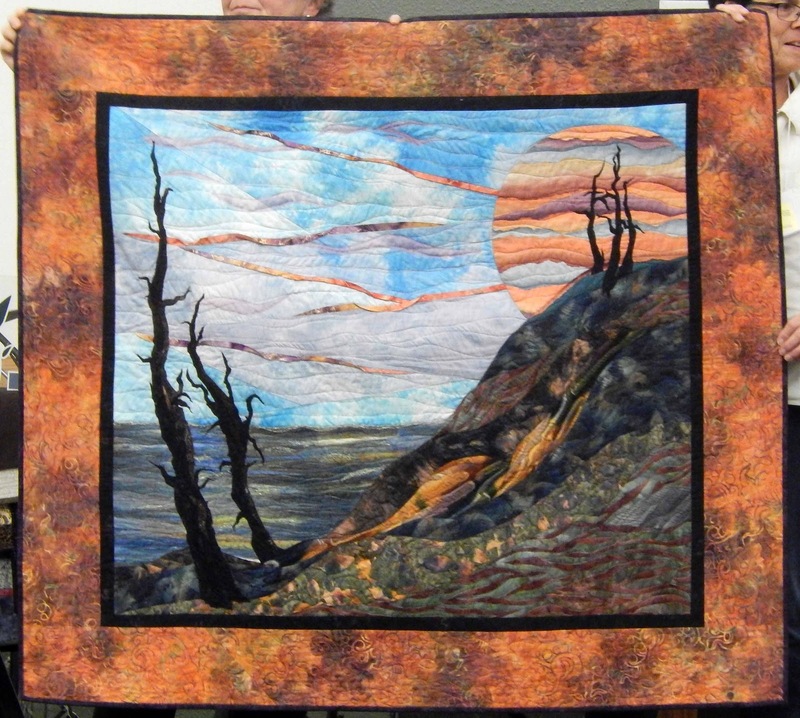 Patty will be doing a two-day workshop for our guild in January. 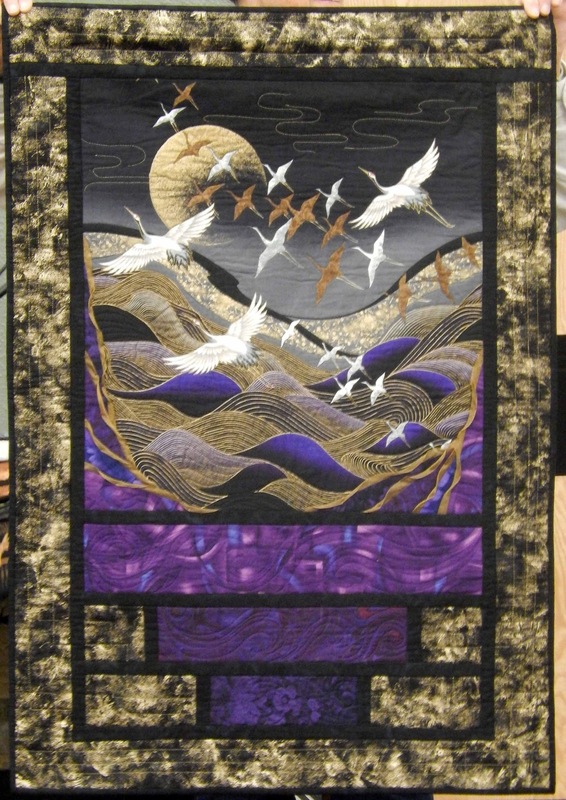 She is a local quilter, designer, and instructor. 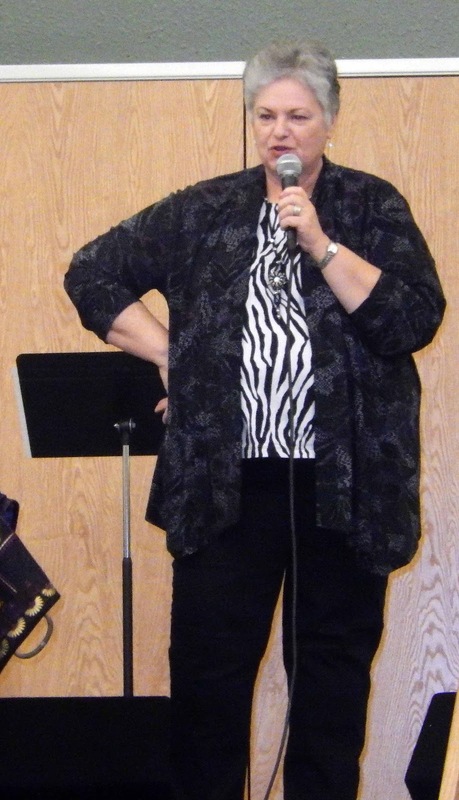 You can learn more about Patti at her website by clicking this link. 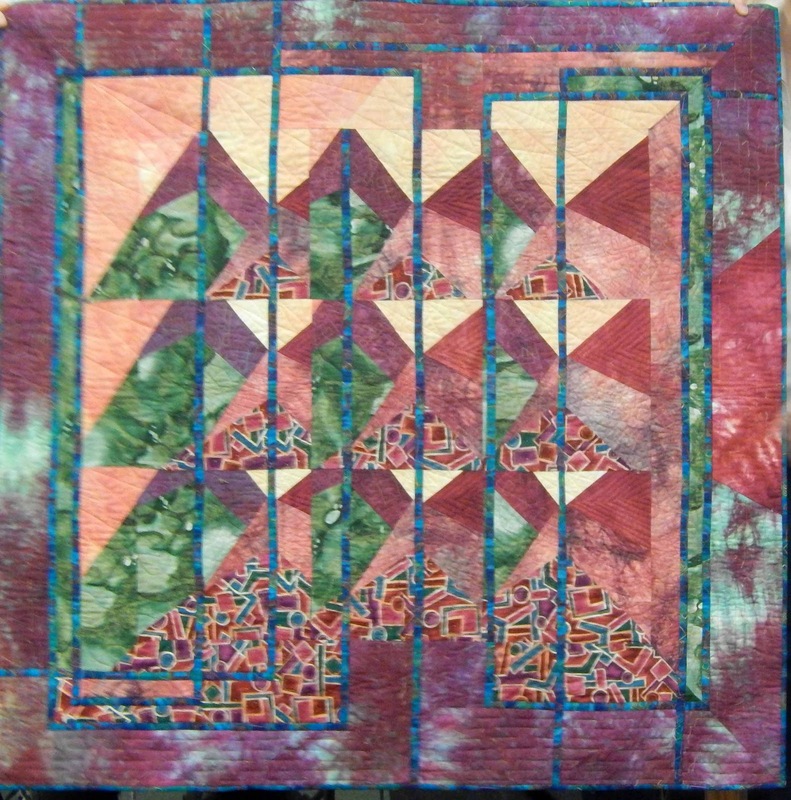 She explained that she found it difficult to follow a pattern, and that caused her to begin designing her own patterns. 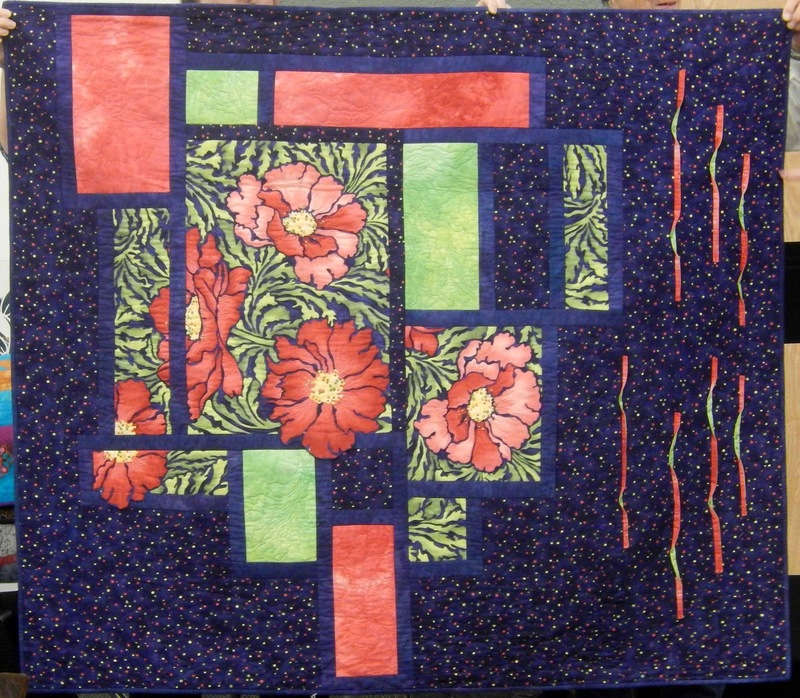 This next quilt was her first pattern. 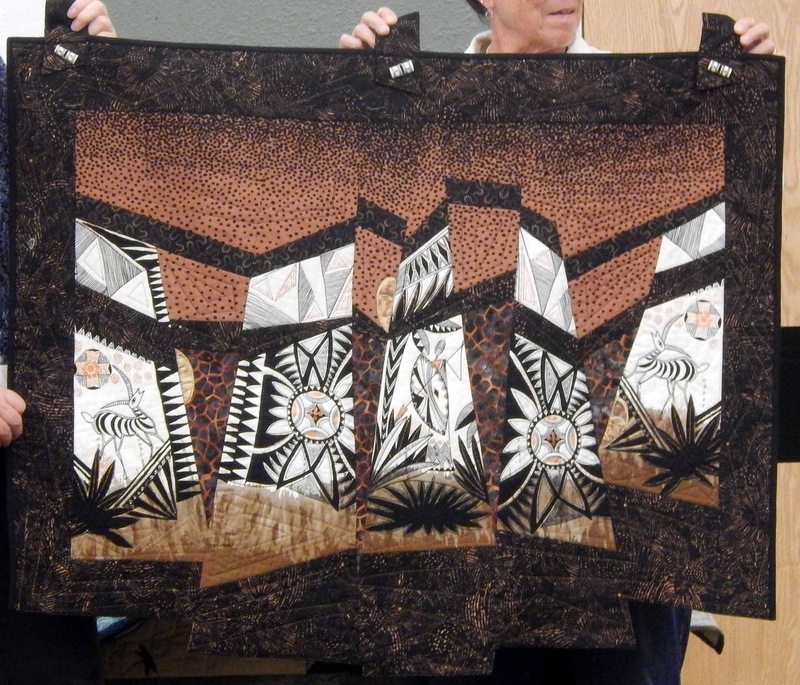 She showed us a number of quilts made from specialty rulers that were popular at one time. 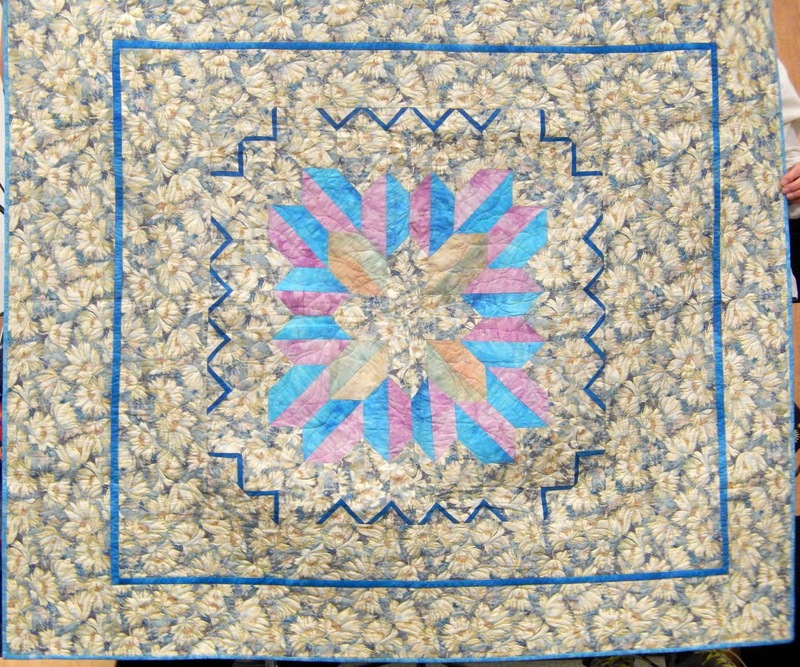 I believe she said this next quilt was from a "wedge" ruler. 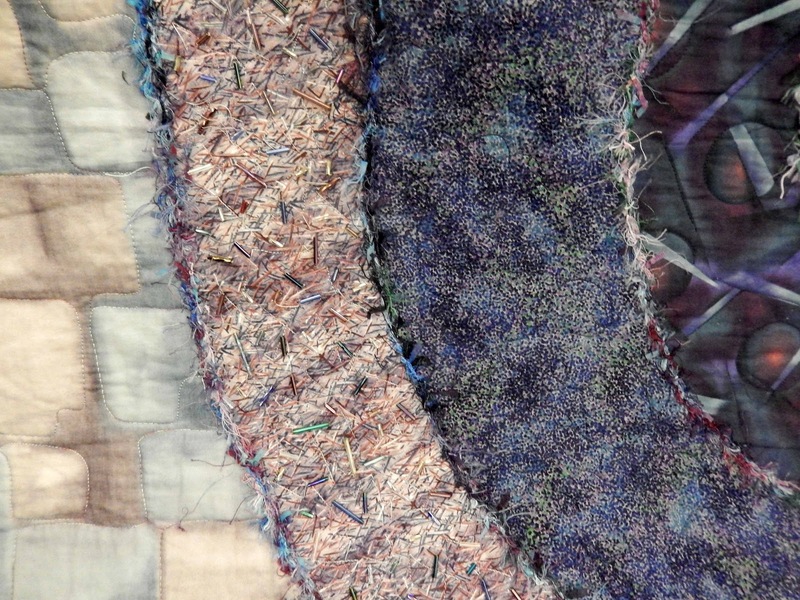 You'll notice in these pictures that Patti is a master at scrounging scraps and trash and using all that she has available in her stash to make multiple original designs. 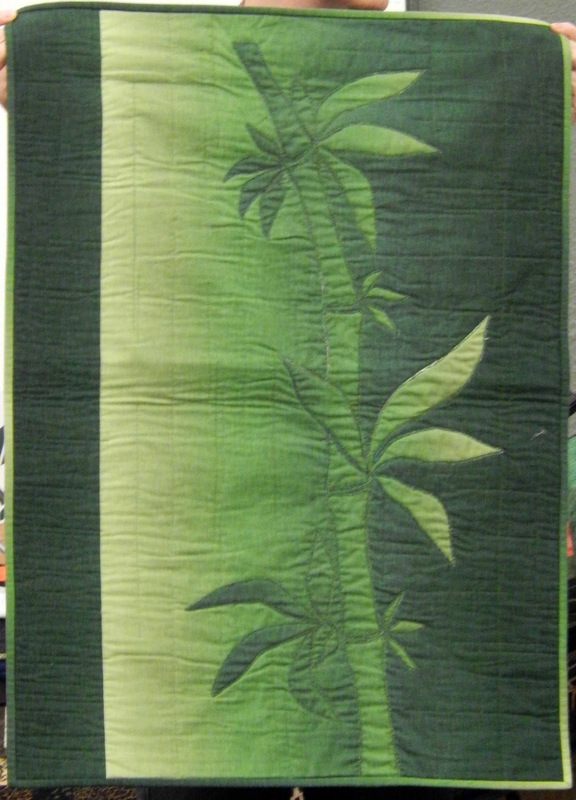 As an example, you can see the same fabric from the quilt above used on both the front and back of this next quilt. 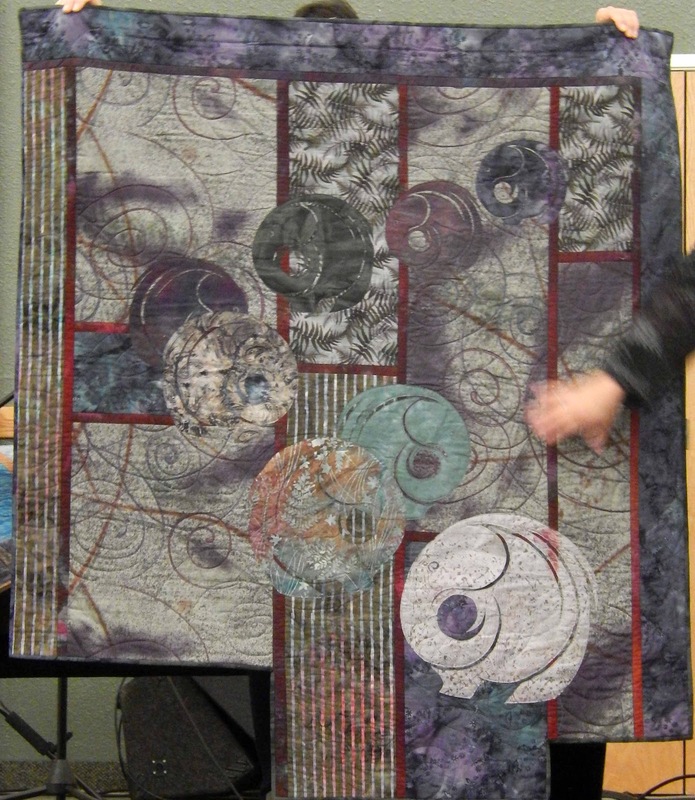 And so she attached it to what is essentially a whole other quilt underneath. 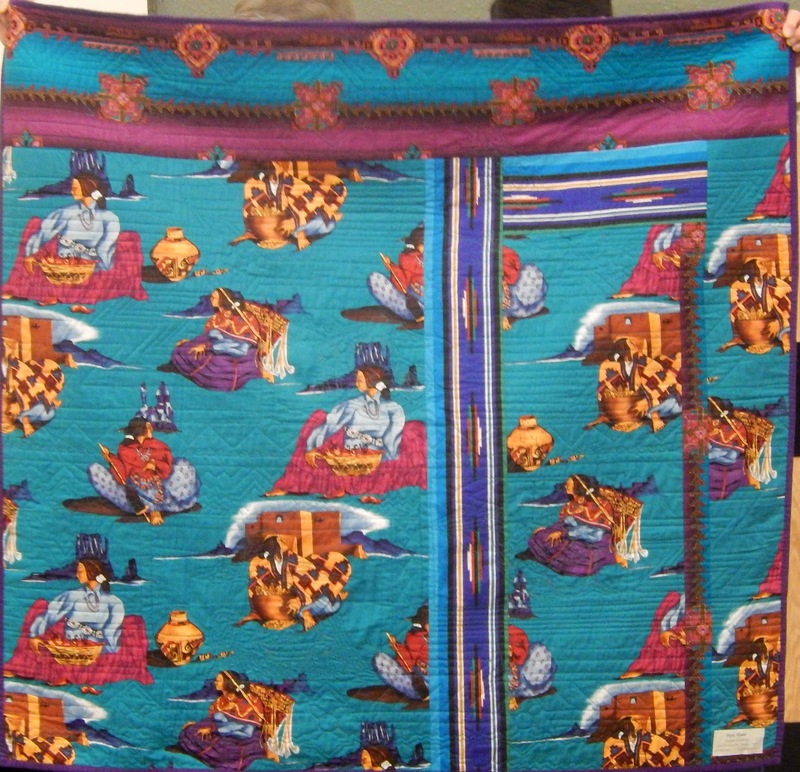 She is a great fan of letting the fabric speak to her, telling her what to do or when to use it and in what quilt. 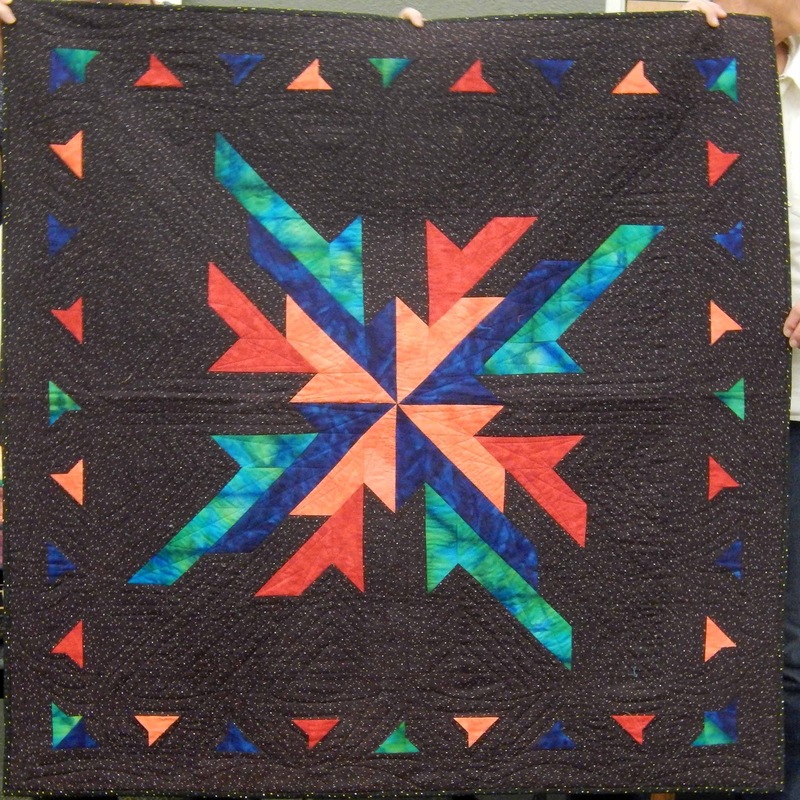 is from the same pattern as this quilt! 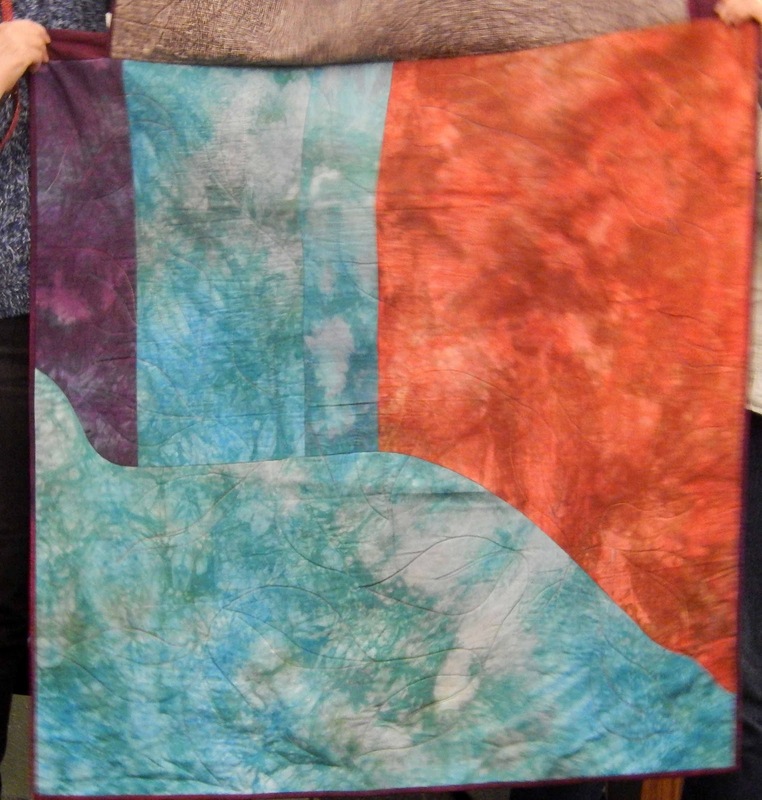 She was pointing out that depending on the fabrics, you can make a design element do whatever you want. 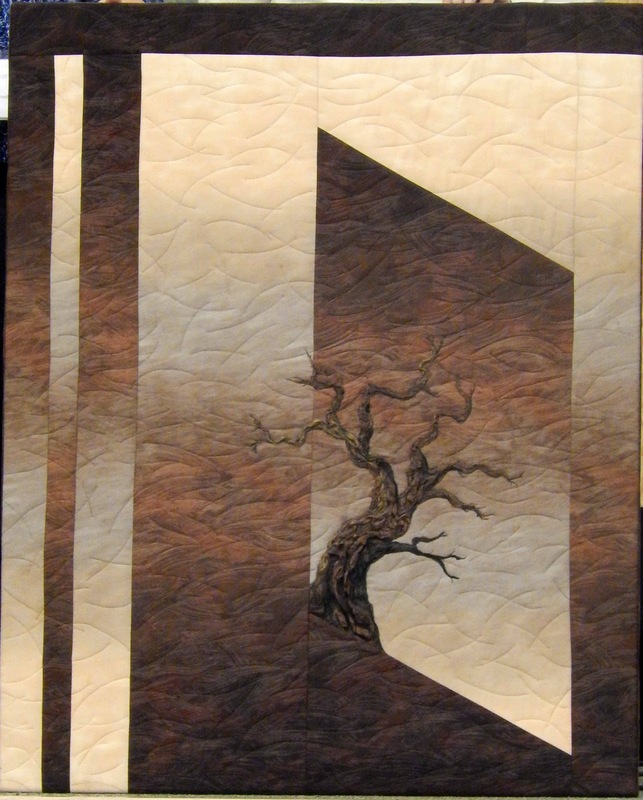 She is also a master at cutting apart blocks in a different way and sewing them back together to create something truly unique and interesting. 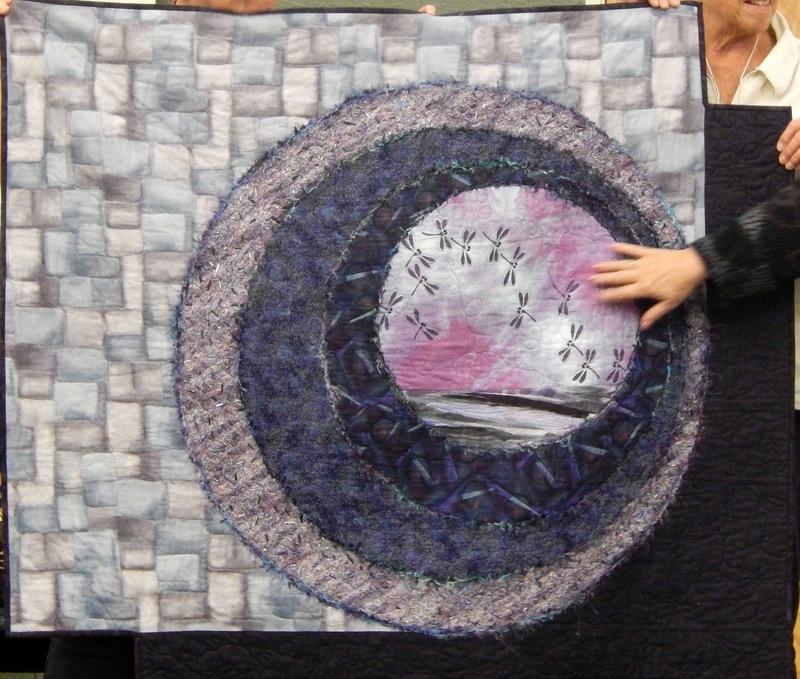 She discussed how she has adapted her teaching methods to create the look of paper-piecing for those who hate paper-piecing. And a technique for doing curves without tears. 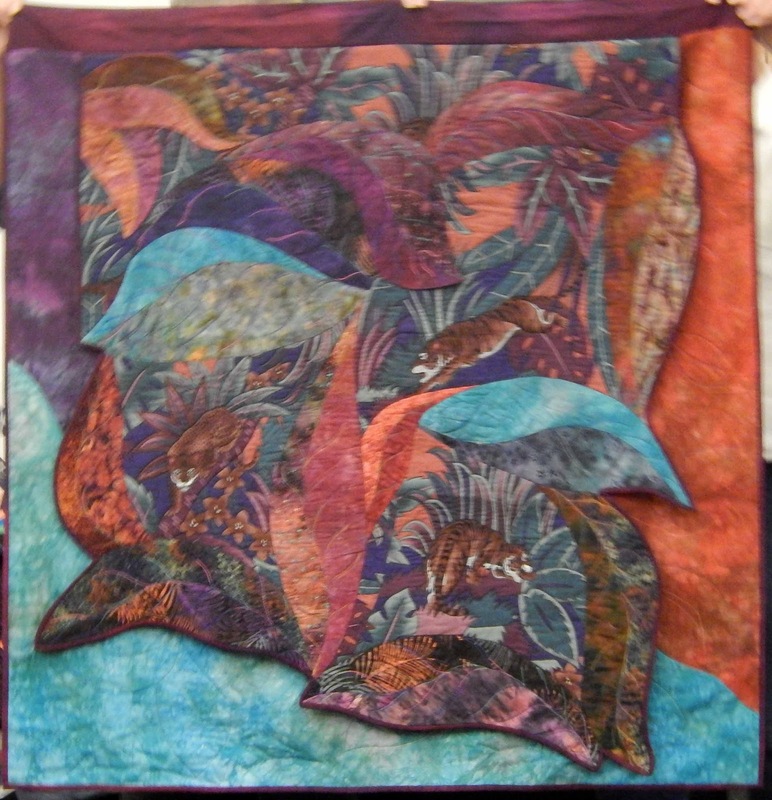 She encourages letting the fabric do all the work in her designs. 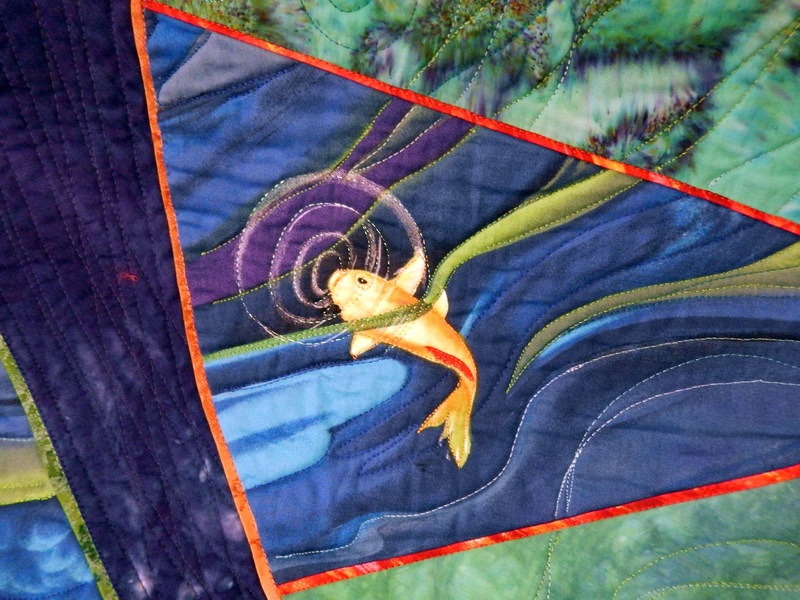 She uses bright colors and creative piecing to create unusual elements. 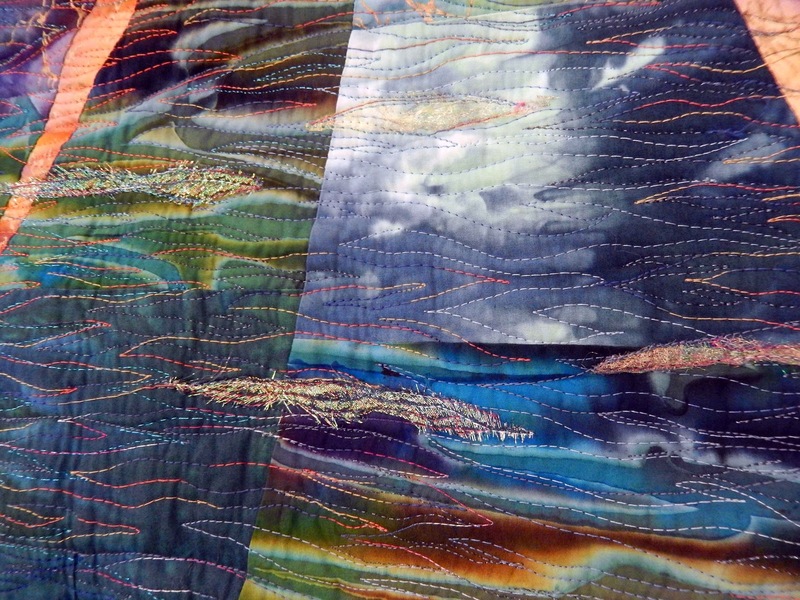 She does a good amount of painting and hand-dying to create her quilts. Here are some of her Asian-inspired designs. This picture really doesn't do justice to this one. 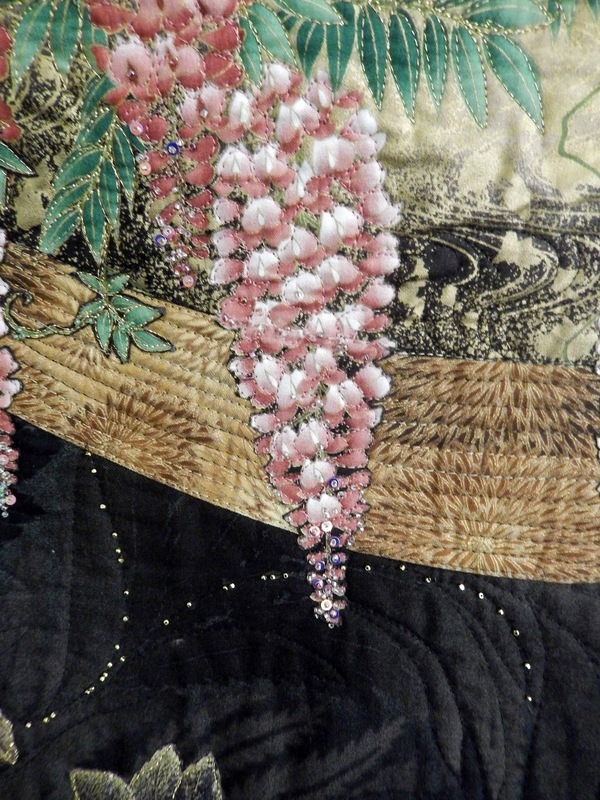 There was bead work on the cascades of flowers that made it sparkle and shimmer in the light. 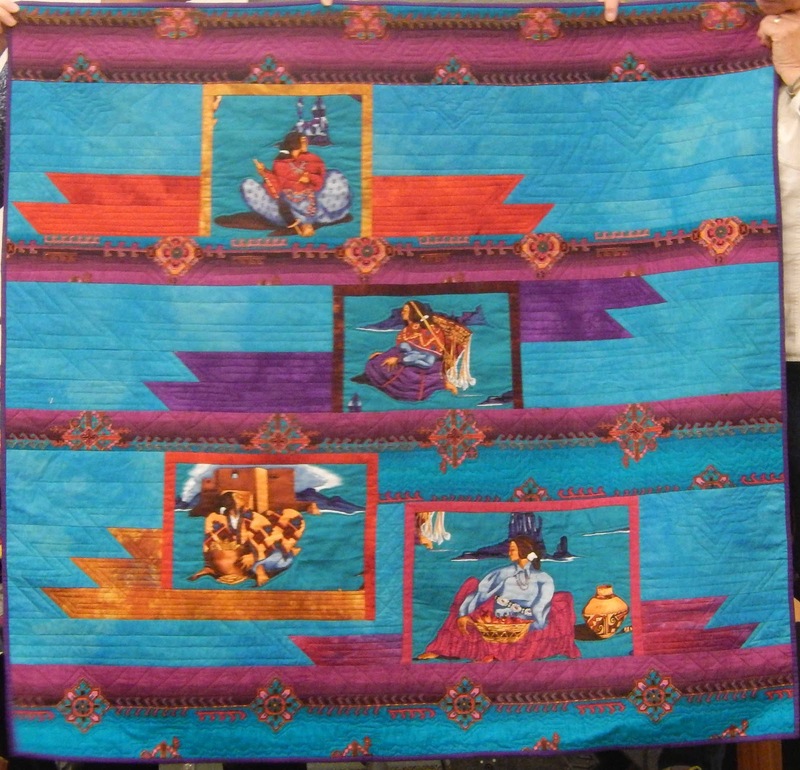 Here are some more of her Asian quilts. 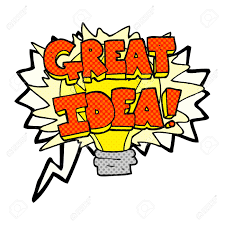 Patti was fond of saying, "this was just an experiment," or "I made this in a day." 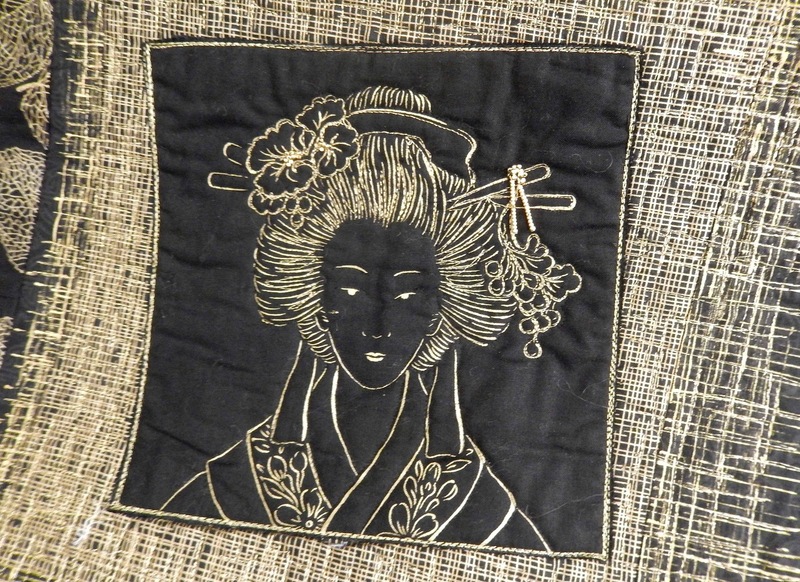 This next one, for instance, is a reverse applique...made in one afternoon. Her use of paint was intriguing. 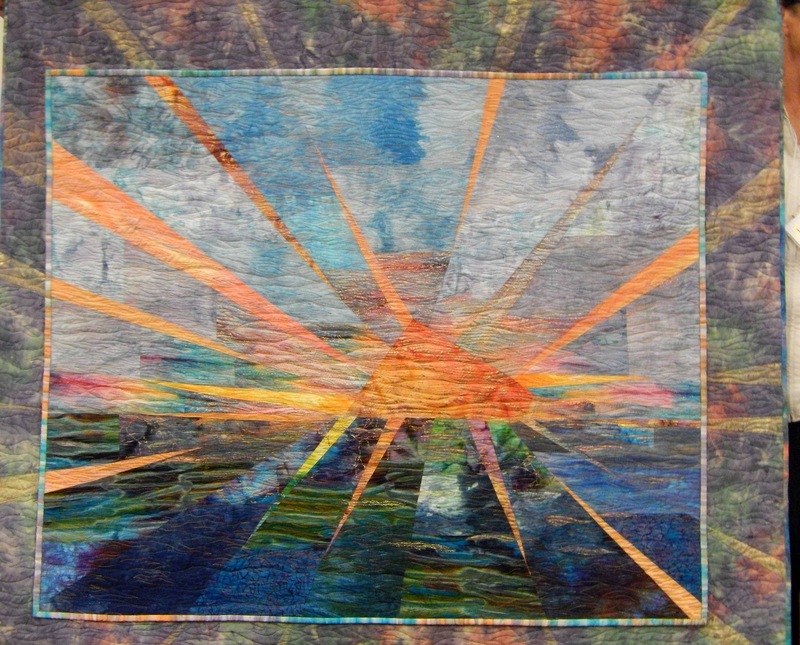 In several of her quilts, she spiced up the backgrounds by dipping the edge of a credit card in paint, and then stitching over the lines. Very pretty. This is her Northwest Sunset. So pretty. 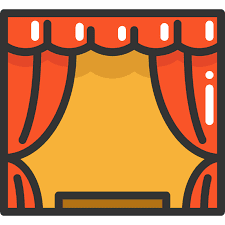 This is an example of a technique she'll be teaching in her workshop. 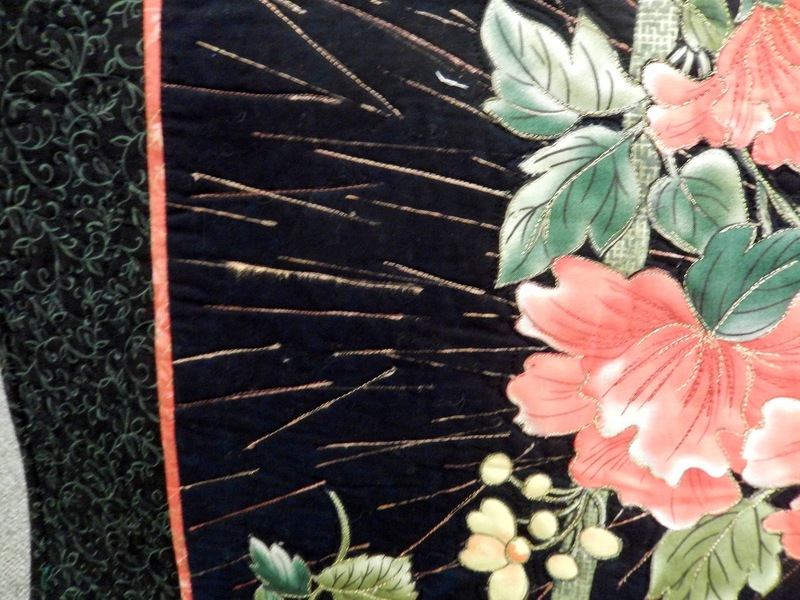 She told us several times that she sometimes bought fabric because nobody wanted it and she felt sorry for it. 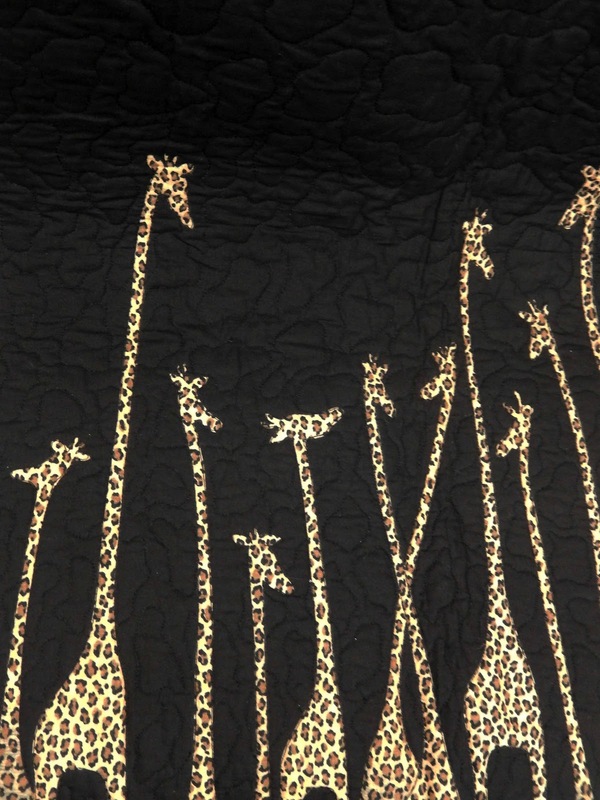 These giraffes are made from one of those fabrics. 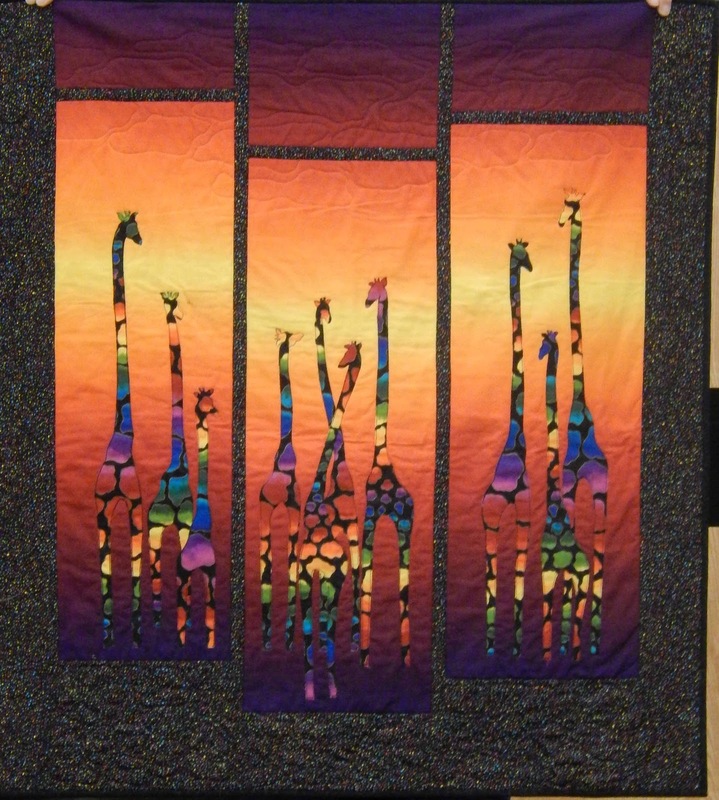 Here are those same giraffes with a different fabric. Her elephants were inspired by a button. 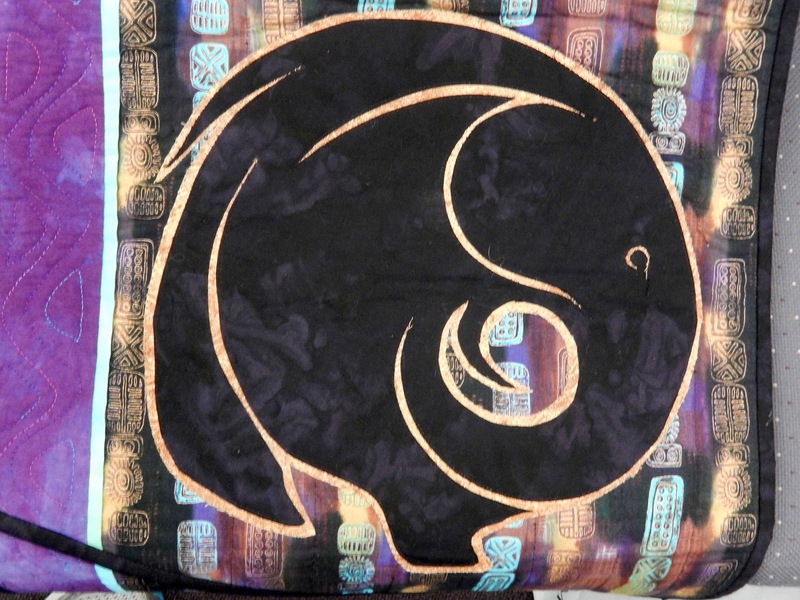 Here are some more elephants, and some of them have three dimensional ears that can be lifted to reveal the quilt underneath. 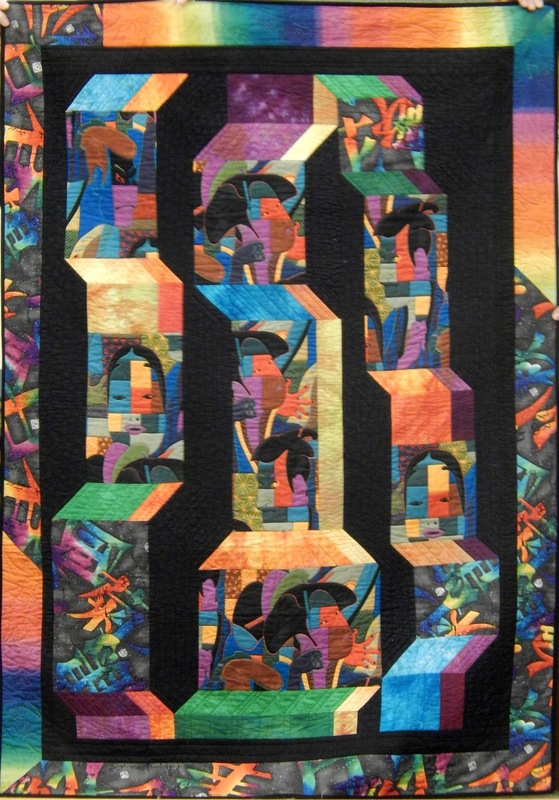 Here's another of her quilts for people who don't like paper-piecing. 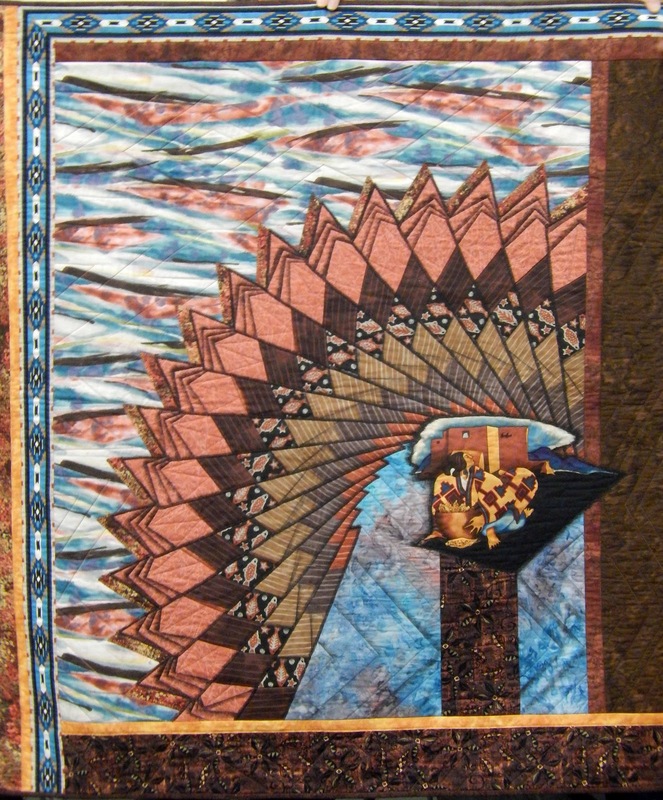 When she finished with this one, she felt it needed something more, and so she created the quilt behind the quilt. Here's some more fabric she purchased because she felt sorry for it. Patti's vision is truly amazing. Does this one remind you of Hawaiian surfers? 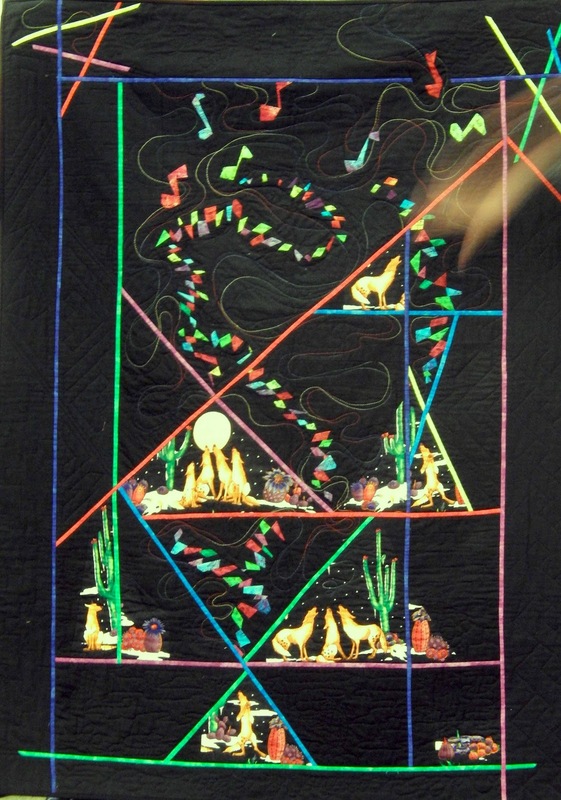 Patti told us that these coyotes were singing to her in the night, and she actually got out of bed to make this quilt. She calls it "A Little Night Music". 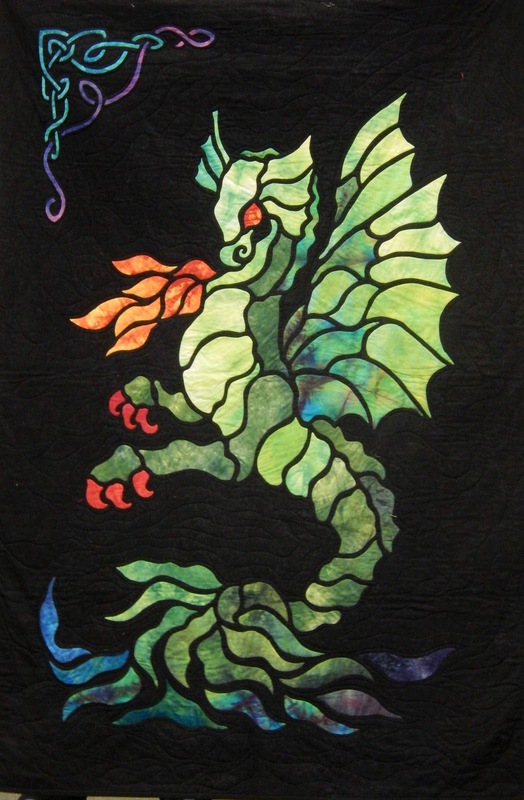 This one is stained glass applique, and this pattern is for sale on her website. She told us she attended a class once. She thought the class was to be about animals, when it turned out to be about portraits. 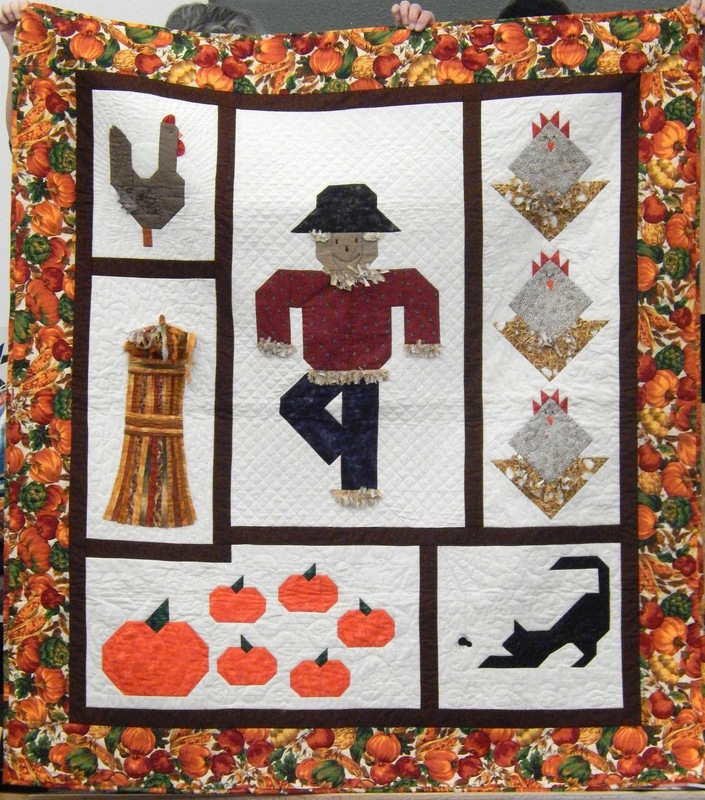 Her classmates brought pictures of children and grandchildren, and she was there prepared for animal quilts. 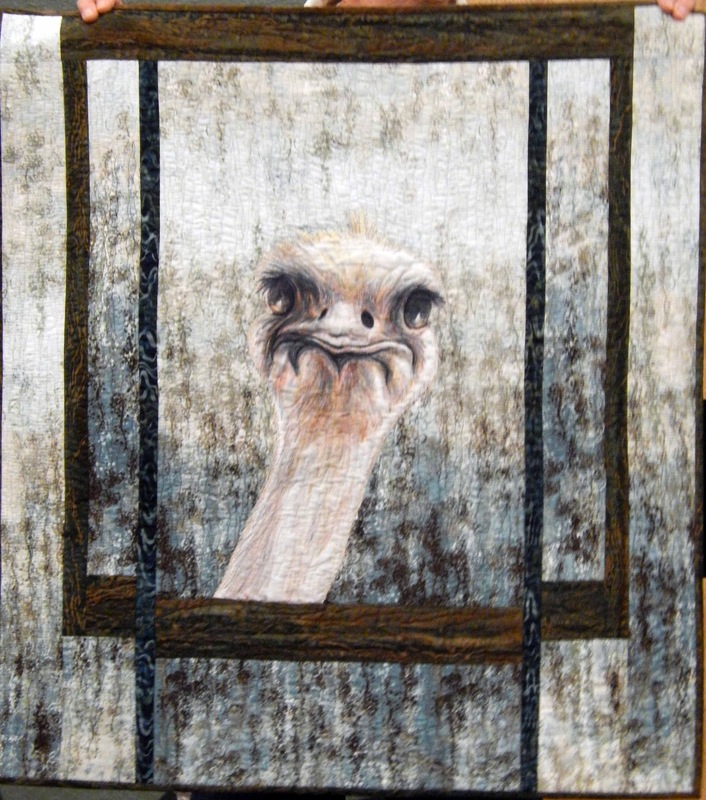 She said she hunted through some pictures she had along and came up with this ostrich from an ostrich farm she'd visited. 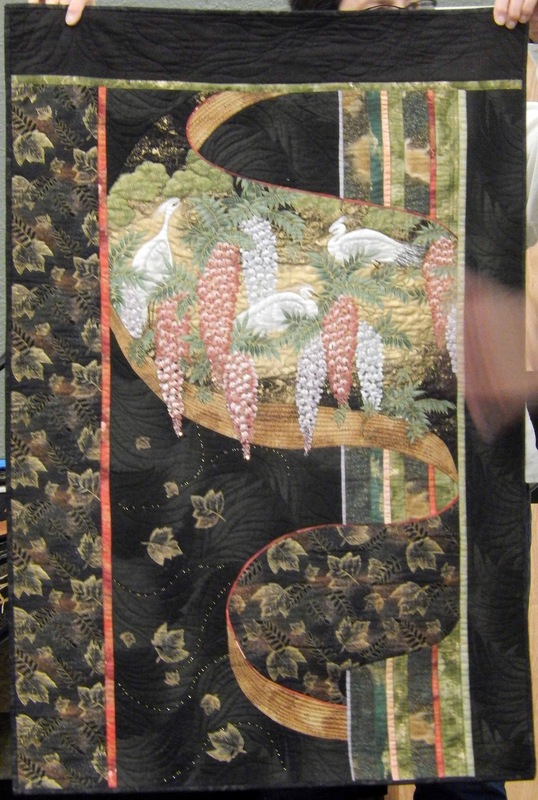 This quilt is the result. 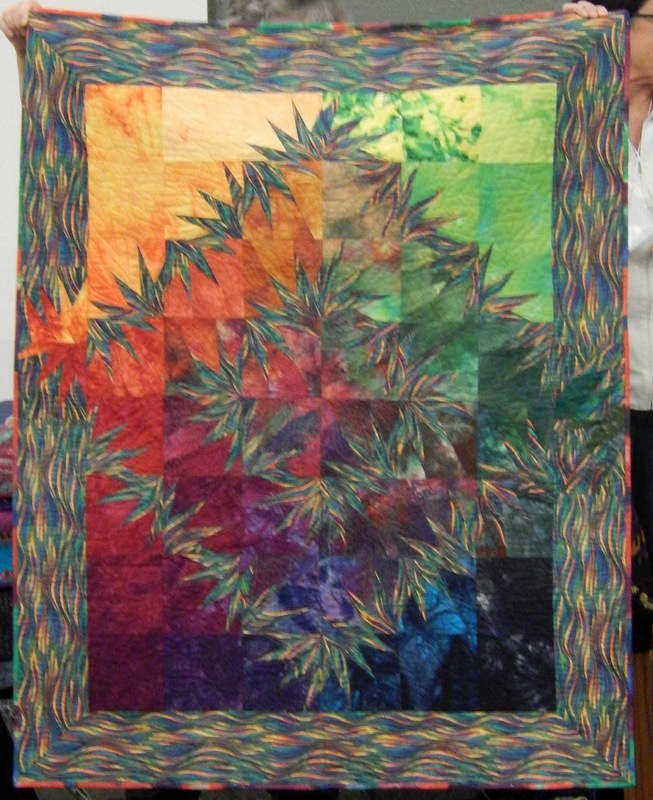 Her use of gradient fabrics and trees resulted in some lovely quilts. 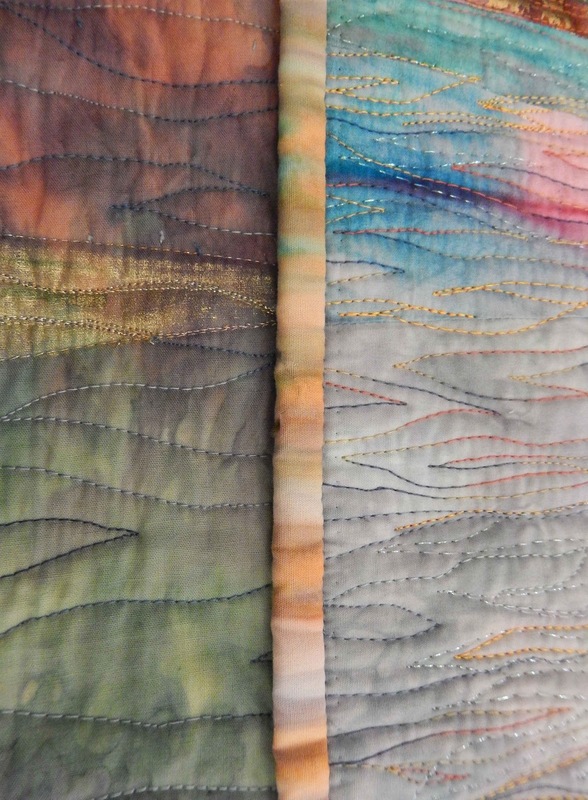 Finally, here is a good example of her hand-dyed fabrics. So, it was an impressive trunk show. 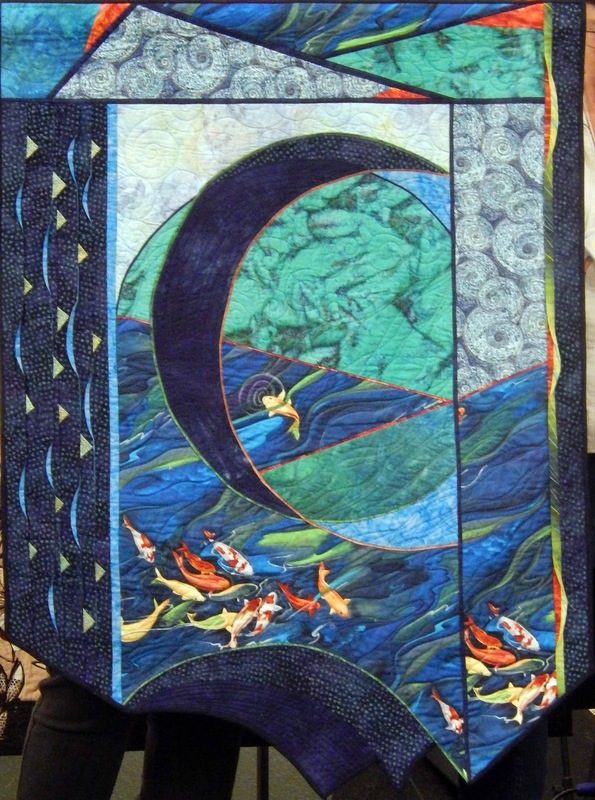 So many designs, so many different quilts, all from this one very talented woman. 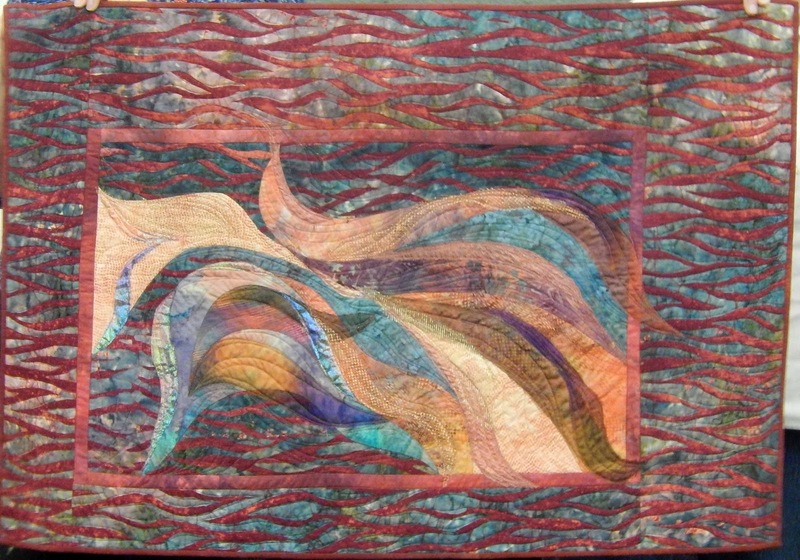 Her small workshop (12-15 participants) is scheduled for the weekend of January 24-25, 2015. It's bound to fill fast, so if you're interested, don't delay!